The other night I was writing in my baby book, and thinking about how lucky I am that the pregnancy has been going so smoothly. No morning sickness and hardly any symptoms to speak of. I’ve had the odd night of heartburn here and there and I was quite tired in the very early weeks, but overall it’s been smooth sailing. Starting on Sunday, I started to feel some dull aching in my lower abdomen, alternating between the right & left side (sometimes both at once). It was a very mild ache, certainly not enough to scare me. I was in the middle of making cinnamon scones and I wasn’t concerned enough to stop. (they were delicious! I will post the recipe at the bottom). I told Andino about it and he wasn’t very concerned either. He said it was inevitable that I would feel something eventually as my uterus expands. The aching continued for a few hours, and I started getting concerned. Andino asked me if I wanted to go to the hospital but I said no because I didn’t want to overreact (or spend my Sunday evening in emergency!). Eventually the aching stopped, but it has returned on and off since then. Never more than a mild discomfort, but enough that I decided to mention it to the public health nurse who works out of our office on Thursdays. She recommended I call my Doctor and ask her opinion. The nurse’s reaction surprised me because I was expecting her to tell me not to worry, that aching is common in pregnancy. After lunch I called my Doctor’s office just for peace of mind. As I was speaking with the receptionist my Doctor walked by, saw my name on the screen and took the call immediately. She told me not to worry, and that at this stage of pregnancy the aching is most likely from the uterus stretching as it moves outside my abdominal cavity. She is usually quite cautious, so hearing her say this made me feel much better. I thought it was so nice of her to take my call like that. There were times during my appointments with Dr.H that I wasn’t extremely fond of her. I guess by the time we met, I was so tired of all the poking, prodding & failed treatments that I was not the perky optimist I was at the beginning of this journey 2 years ago. I was beginning to think that I suffered from unexplained infertility and wished that she would treat me more aggressively. (Specifically, I wanted something for my lining which never got above 7mm). Dr. H kept assuring me that we had great chances and that 7mm is not too thin to achieve pregnancy. I guess she was right because we had success on our first treatment at our province’s fertility clinic. (We also had one IUI performed at the local hospital, but Andino and I are quite skeptical of the nurse’s methods there). As a matter of fact, we were Dr. H’s first patients that she sent to the fertility clinic located in a different city. She told us at our 8 week appointment that she is no longer offering IUIs locally, in favour of sending all her patients to the fertility clinic. She thanked us for being her test patients and for all our feedback of the two experiences. Preheat oven to 400 degrees. Combine flour, baking powder, baking soda and salt. Cut in butter until mixture is crumbly. Separate the egg white and yolk. Set the egg white aside. In a separate bowl, mix egg yolk, honey and buttermilk (or milk/lemon juice mixture). Add to the dry ingredients and stir until just combined. Form dough into a ball on a floured surface. Roll or pat out to half an inch in thickness and eight inches in diameter. Cut into eight equally-sized pieces. Transfer to a greased baking sheet. Whisk the egg white until froth forms and brush over the tops of scones. 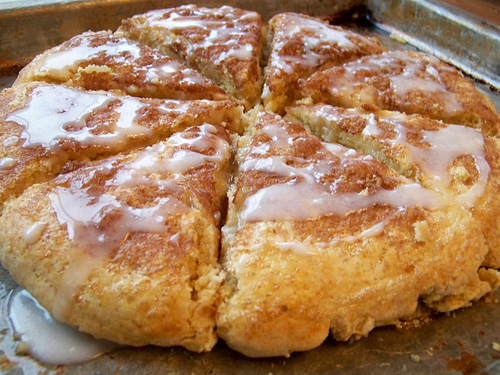 Mix turbinado and cinnamon together and sprinkle over egg-white-topped scones. Bake at 400 degrees for 10 to 12 minutes. Those scones sound and look amazing!! Glad you’re feeling good overall. I’ve been experiences lower abdomen pain pangs, too! I tend to freak out about them, so I admire your Zen confidence. It does sound like normal expanding/stretching. Just think of how much our bodies are changing right now! It’s crazy. Can’t wait to hear about the ultrasound. I wish I had a gluten free version for you! Sorry to torment you with recipe photos! Those scones look amazing. Now I’m hungry! Sorry you’re feeling achy…I hope it eases up. you gotta try the scones, so perfect with a cup of tea! Very mild cramps and little sharp twinges are about the only symptom I have so far! I keep waiting for the nausea to set in….. Those scones look so good! Yum! And I totally get the RLP. The first time it happened to me, it freaked me out big time! I’m super impressed with your calmness as you venture through this first trimester. I was a mess in btw appointments. I’m just so glad you are able to enjoy pregnancy And stay relaxed for the most part. You will be so shocked at the difference in the baby from 8 weeks to now. It’s amazing and totally cool how much they grow in such a short period of time! OMG those scones look delicious! Echoing Amber’s comment, I am so excite for your 12 week scan, be prepared to start falling in love! Well I’m glad to know it is not only happening to me! I know I will feel so much better once I have the ultrasound though. I’m excited to see you too!! I hope I have a bump by then! Those scones look delicious. I am going to have to try them. I had lots of round ligament pain. I tended to get it really bad for a day or two and when it was gone, people would start telling me I looked bigger. My skin would also start to feel really tight at the same time,, like it was trying to stretch out more. So it was definitely growing pains. It’s uncomfortable, but a good reassuring thing that baby is growing. I’m so glad I wrote about this so I know it is normal. I am excited to get bigger so I really look pregnant!